The Bay Area Solidarity Action Team (BASAT) is an ad-hoc group that initially formed for white people to respond to the call from Ferguson for white folks to take big action in solidarity with the Black Liberation Movement. After our first action at the Oakland Christmas Tree lighting ceremony on Dec 5, 2014, the next big event pivoted to be a multi-racial action that shut down the Oakland Police Department with 11 simultaneous blockades for 4 hours and 28 minutes on December 15th. In the wake of the action, we are distilling lessons and determining whether BASAT should be a multi-racial vehicle, or one specifically for white people to work with non-Black groups of color in solidarity with this Black-led movement. We have been using protocol and principles to guide us in this work, and now have a new updated document, integrating some of what we have learned, that we would like to share and spread publicly. This is a living document that will continue to evolve. The foundation for this protocol came from The Ruckus Society’s Action Framework. Additionally we are collaboratively writing an article that distills specific lessons, which will be shared soon. • We commit to following leadership from the front lines; in this struggle that means Black organizations who are locally and nationally connected to this movement. We follow the guidance from Black organizers and their groups specifically on strategy, goals, vision, tone, and message of actions. Receiving such guidance is a gift of capacity and time from these Black groups, and we are committed to taking direction, while learning from them how much time they wish to give to solidarity groups trying to do this work. • In this moment of ad-hoc group formation and self-organization, we commit to building infrastructure that allows for organizational accountability. We will distinguish between consultation with individual Black organizers, and ongoing group consultation (recognizing that some Black-led groups are also in formation stages), and include a diversity of perspectives, strategies, and tactics. • We commit to building accountable relationships with non-Black people of color with whom we collaborate to support this Black-led movement. We will learn from and support their leadership, remain conscious of internal power dynamics between white folks and non-Black people of color, while co-creating multiracial spaces. • We make solidarity real through action and behavior. Accountability is a relationship. There may be moments where we are out of alignment, and we commit to our own course-correction with each effort, action, meeting, mobilization, and agreement. • We will leverage the access that some of us have to various resources to help advance the goals of this Black-led movement, including from allied organizations who may not be central to this fight but can lend critical skills and capacity. • We will leverage our white privilege in direct actions in explicit ways aligned with Black strategies. • We understand that taking accountable action in this movement requires long-term political relationships (organizationally and personally) and building trust through long-term commitment and shared struggle. We know that in movement work and “movement moments” like this, it is the alignment that comes from long-term relationships that helps us navigate complexity and challenges. • We aspire to show up in clear integrity and action logic in our role as a non-Black solidarity group, be clear about why white people are taking action as white people, and represent ourselves authentically so we can lift up Black voices in tone, content, media, and demands. We will engage in political education with each other and other white people to center Blackness in solidarity actions. We will articulate our own role, so that white people do not adopt Black messages and approaches that do not apply to white folks, and thus erase the racial context (i.e. “I am Mike Brown”, “I Can’t Breathe”, etc.). • We are being directly asked to turn it up and go big. We will collaborate through complex, emergent and “imperfect” situations. We will not let the white culture of perfectionism get in the way of us taking bold action. Many of us are accustomed to accountability protocol that assumes lots of time and capacity for consultation. In this moment, where we need to move quickly, we will continue to attempt to apply our accountability protocol to learn how to show up well in fast-paced situations. Specifically, we will not allow the white culture of “frantic-checking-in” to lead us to asking more time and capacity from Black groups than they have agreed to give, and not let our own self-consciousness turn into the white culture of deference that freezes us. We are willing to navigate contradiction, and willing to make mistakes. • We commit to staying grounded in our reasons for joining this fight. Our own liberation is bound to the liberation of Black people. We will stay present with our own humanity, honor the humanity of those with whom we collaborate, be humble, listen, connect, and feel. We will stay emotionally connected to the gravity of the war on black people, and not get lost in the logistics of action planning. • We commit to taking action that holds space for community vision, aligns with national demands from FergusonAction, and places our bodies in the path of injustice. • We will be bold and militant when confronting injustice. We do not take a stance on tactics that other groups choose to use in their circumstance. For our actions, we will do no violence against other living beings, and we will not engage in intentional property destruction, as it can distract from the political goals we are being asked to amplify and uphold. • We will constantly evaluate and learn from our mistakes and strengths, and share learning with others. • Many of us are sprinting and in rapid-response mode. We will rotate roles so we can care for ourselves and each other to keep actions going. We will ask for what we need from each other to stay healthy and committed to the long-term fight, in this moment where we are pushing ourselves to continue acting in a consistent and strong way to harness the exponential potential of this moment. We know that in order to achieve the national FergusonAction demands, continued work over the long haul is required. We will find ways to embed this work in our day-to-day lives even when the media stops highlighting it. On Monday, Dec 15th 2014, members of newly organized all-Black groups, including The Blackout Collective, #BlackBrunch and #BlackLivesMatter, joined with Asian allies in #Asians4BlackLives group and white allies in the Bay Area Solidarity Action Team to lead an occupation of the Oakland Police Department and demand an end to the war on Black people in Oakland and everywhere. Approximately 150 people participated in the action and were joined by a crowd of over 100 supporters. Protestors blocked entrances into the police department and the busy downtown intersection outside for 4 hours and 28 minutes. The 4 hours honor the memory of Michael Brown, whose body lay in the streets of Ferguson for more than 4 hours after he was killed by a police officer. The 28 minutes represent the startling fact that every 28 hours a Black person is killed by police, security or vigilantes in this country. Simultaneous to the blockades, a protestor climbed the flag pole directly in front of the police headquarters to fly a banner with the faces of Black people who have been killed by police: Eric Garner, Tamir Rice, Oscar Grant, Alan Blueford, and Renisha McBride. The newly released video captures the protestors during the four and a half hour action and features short interview clips with representatives from #BlackBrunch, #Asians4BlackLives, Alan Blueford Center for Justice, and the Bay Area Solidarity Action Team. There were approximately 40 arrests, with some misdemeanor charges. The action attracted national media attention, resulting in 30 media hits, including major outlets such as AP and LA Times. The hashtag for the action, #ShutDownOPD, rated the second most popular hashtag during the day. The Black, Asian and white groups joined in solidarity to call for an end to racist police violence and the immediate implementation of the Ferguson Action demands: http://fergusonaction.com/demands/. 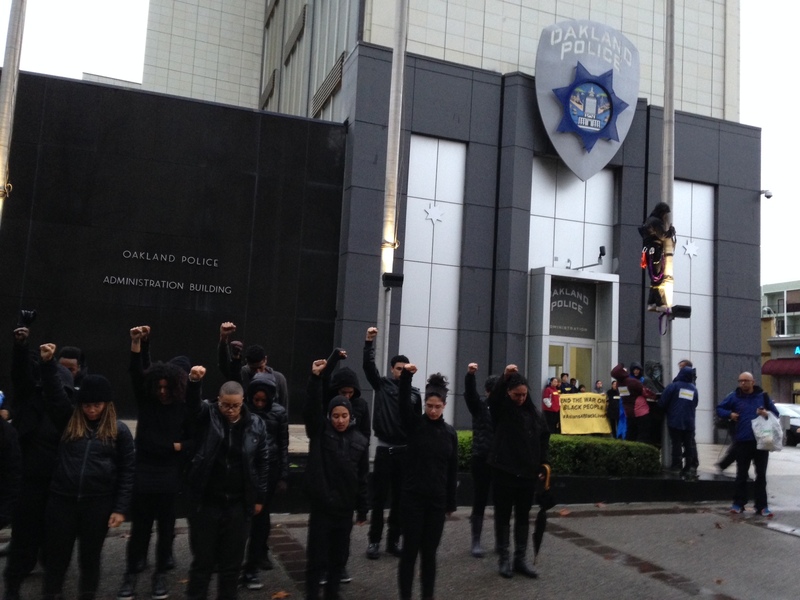 At approximately 7:30 am this morning, the Oakland Police Department Headquarters was blockaded by protestors demanding an end to racist violence against the Black community. One person climbed the flagpole directly in front of the Oakland Police Department Headquarters to fly a banner in honor of Black people murdered by police. Minutes later, a group of about 30 Black protesters occupied the space in front of the police department and called for an immediate end to the war on Black people. As members from the all-Black groups #BlackLivesMatter, Blackout Collective, and #BlackBrunch sang freedom songs for the many Black people killed at the hands of police and for the Black community who is still breathing, an Asian solidarity group called #Asians4BlackLives blockaded the doors to the police station. They were joined by a white solidarity group called Bay Area Solidarity Action Team (BASAT), who also blockaded entrances into the building. A total of four sets of doors were blocked at the police headquarters. The banner raised on the flagpole commemorates lives taken by police violence, including Oscar Grant, Eric Garner, Tamir Rice, Renisha McBride, and Alan Blueford. Another set of protestors locked themselves to the base of the flagpole to prevent the banner from being removed. Protestors proudly sustained their action for 4 hours and 28 minutes: 4 hours for the time Michael Brown’s body lay in the street in Ferguson and 28 minutes to represent the fact that every 28 hours in the US a Black person is killed by police, military, security or vigilantes. By noon, the protest was cleared. 37 arrests were made and most protestors were cited and released quickly. Charges against protestors included obstructing public agencies and resisting police officers. While cutting protestors away from one door, authorities accidentally smashed a window of the police department. Protestors from all groups pressed for the national Ferguson Action demands to be immediately implemented locally and nationally (available below and at: http://fergusonaction.com/demands/). We stand on the doorstep of the Oakland Police Department today as a group of Asians putting our bodies on the line in response to a national call to shut down institutions that perpetrate the war on Black people. It is unacceptable that every 28 hours a Black person is killed by the police, security or vigilantes. As Asians, we recognize the ways in which we’ve been used historically to prop up the anti-Black racism that allows this violence to occur. We are an extremely diverse community. Some of us have been targeted, profiled, and killed by U.S. government institutions. Many of us came to the U.S. as a result of the devastation and displacement caused by the US military and its “partners” in Asia, only to find a country uses police to devastate and displace black communities. However, we also recognize the relative privilege that many of us carry as Asians living in the U.S.
“We are striving for a world where we deal with harm in our communities through healing, love, and kinship. This means an end to state sponsored violence, including the excessive use of force by law enforcement. We are committed to an America that comes to terms with the trauma of its painful history and finds true reconciliation for it. Mass incarceration and the over criminalization of black and brown people must forever end, leaving in its place a culture that embraces our histories and stories. This means an end to racial bias and white supremacy in all its forms. We understand that our liberation depends on the liberation of black people, and echo the demands that have come out of Ferguson. Strict limits on the transfer and use of military equipment to local law enforcement and the adoption of the Stop Militarizing Law Enforcement Act of 2014. The federal government should discontinue the supply of military weaponry and equipment to local law enforcement and immediately demilitarize local law enforcement, including eliminating the use of military technology and equipment. A Comprehensive Review of systemic abuses by local police departments, including the publication of data relating to racially biased policing, and the development of best practices. A comprehensive review by the Department of Justice into systematic abuses by police departments and the development of specific use of force standards and accompanying recommendations for police training, community involvement and oversight strategies and standards for independent investigatory/disciplinary mechanisms when excessive force is used. These standards must include a Department of Justice review trigger when continued excessive use of force occurs. A comprehensive federal review of police departments’ data collection practices and the development of a new comprehensive data collection system that allows for annual reporting of data on the rates of stops, frisks, searches, summonses and arrests by race, age, and gender. These standards must also include a DOJ review trigger when departments continue discriminatory policing practices. Repurposing of law enforcement funds to support community based alternatives to incarceration and the conditioning of DOJ funding on the ending of discriminatory policing and the adoption of DOJ best practices. The repurposing of Department of Justice funds to create grants that support and implement community oversight mechanisms and community based alternatives to law enforcement and incarceration—including community boards/commissions, restorative justice practices, amnesty programs to clear open warrants, and know-your-rights-education conducted by community members. The development of a DOJ policy to withhold funds from local police departments who engage in discriminatory policing practices and condition federal grant funds on the adoption of recommended DOJ trainings, community involvement and oversight strategies, use of force standards and standards for independent investigatory/disciplinary mechanisms. A Congressional Hearing investigating the criminalization of communities of color, racial profiling, police abuses and torture by law enforcement Congressional hearings investigating the criminalization of communities of color and systemic law enforcement discriminatory profiling and other abuses especially at the local level—including an examination of systemic structures and institutional practices and the elevation of the experiences and voices of those most impacted. Congressional hearings will allow for a continuation of the national discussion about police abuse and it’s underlying causes. Support for the passage of the End Racial Profiling Act (ERPA) which in law would prohibit the use of profiling on the basis of race, ethnicity, national origin or religion by law enforcement agencies. The development and enactment of a National Plan of Action for Racial Justice by the Obama Administration. The National Plan of Action for Racial Justice should be a comprehensive plan that address persistent and ongoing forms of racial discrimination and disparities that exist in nearly every sphere of life including: criminal justice, employment, housing, education, health, land/property, voting, poverty and immigration. The Plan would set concrete targets for achieving racial equality and reducing racial disparities and create new tools for holding government accountable to meeting targets. Today, Bay Area Solidarity Action Team (BASAT) celebrates the freedom of the Black Friday 14 from unfair punishment and criminal charges. After a year of public pressure, including petitions, rallies, and further civil disobedience by leaders from labor and faith communities, and other allies, D.A. Nancy O’Malley has announced today that she is dropping the charges against these 14 Black activists who — in the tradition of civil rights activists past and present — peacefully blocked BART trains as part of nationwide actions calling attention to police murders of Black men, women, trans folks, and children. It is a fact that these Black activists were singled out, while countless others who took action to end the War on Black Lives since then have not faced charges (including members of BASAT and other ally groups). Because of this selective prosecution, we had to question D.A. O’Malley’s commitment to addressing racial injustice. Today we recognize O’Malley for listening to the calls of people of conscience who stand with the Black Friday 14 and have demanded their charges be dropped. We congratulate the courageous Black Friday 14 on this victory. This is a victory for people-powered movements who boldly take action and demand justice. We are being heard, and today one of our demands has been met. Now, we call on Nancy O’Malley to commit the full resources of her office to end the state-sanctioned War on Black Lives that her department helps wage. Dropping the charges against the Black Friday 14 was a necessary first step for O’Malley to prove she wants to be on the side of justice. But there is a long road ahead, and there is much work to be done. Dropping the charges is a beginning, not an end. We are proud to have joined hundreds of community leaders, BART riders and concerned residents in demanding these charges be dropped. Now, we will continue to stand with these 14 activists and the broader movement for Black Lives in the long struggle ahead to dismantle white supremacy and end the War on Black Lives. Because none of us are free until all of us are free. BASAT is an ad-hoc network of racial justice activists in the Bay Area who — inspired by the Black Friday 14’s bold action — joined together in Fall 2015 to use white solidarity to take action to challenge white supremacy and support Black liberation. 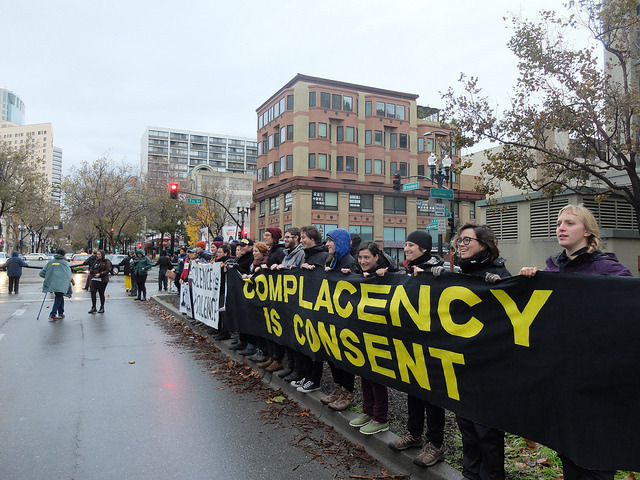 Rain had temporarily cleared in downtown Oakland one morning earlier this week as 250 people flowed around the main headquarters of the Oakland Police Department, blockaded intersections, and chained themselves together in front of the building’s doors. For the next several hours the activists, black, white and Asian, occupied the space with chants and protest songs. Black protesters held a banner that read “Black and Breathing;” white activists held banners reading “Complacency is Consent” and “Silence is Violence;” a group of Asian Americans, chained to one of the building’s entrances, held a sign reading “End the War on Black People.” On the flagpole in front of the OPD’s main entrance a flag was raised bearing the faces of Eric Garner, Oscar Grant, Tamir Rice, Renisha McBride, and Alan Blueford — five whose lives were cut short by police violence in the last five years. This was the latest action in an ongoing uprising across the country in the wake of two separate grand juries’ failure to indict the officers who killed Mike Brown in Ferguson, Mo., and Eric Garner in Staten Island, N.Y. It should be no surprise that people in the Bay Area are taking to the streets in protest — both spontaneous, like the nightly marches that disrupt traffic and block freeways, and coordinated, like the Blackout Collective’s BART shutdown on Black Friday and today’s blockade of Oakland Police headquarters. What’s happened in Ferguson and New York is happening in Oakland. Of the 78 killings by OPD, CHP and BART police since 1970, 74 percent were of black people and 99 percent were people of color, among them Oscar Grant, Gary King, and Alan Blueford — names that are hauntingly familiar by now on the streets of Oakland. The numbers are hard to believe. A black person is killed by police, security, or vigilantes every 28 hours in the United States. But they are hardest to believe for those of us who are institutionally protected and systemically segregated from the pain of others’ lives and losses. And the numbers only go so far in conveying the outrage we should feel as we witness a wave of institutional violence every bit as deplorable as the lynchings of the last century and the chattel slavery of the centuries before. Such acts of violence benefitted, and continue to benefit, the privileged and the powerful. And it’s time for it to end. The OPD shut down was a coordinated action among several all-black groups, an Asian solidarity group and a white solidarity group. But unlike the structural inequity that still plagues our society and the structural violence that plagues our legal system, this action was broken out among different racial groups with the intention of telling a clear story. If black people are to gain the justice they deserve, white people need to speak up, speak out and put our bodies on the line in ways that create space for action by black leadership. Police violence is a moral crisis for our country, and it is the most brutal face of an economic crisis that kills black people every day, if not with bullets then with mass incarceration, heart disease and homelessness. White people cannot turn a blind eye any longer. It is time for us to join with black communities — and specifically respond to the requests of black organizers, such as those put out by Ferguson Action (http://fergusonaction.com/demands/) — to demand an end to racist police violence. White silence means more violence. It’s time to choose sides. Let’s choose justice. Brooke Anderson is a staff collective member of the Movement Generation Justice & Ecology Project of Oakland. She wrote this article for this newspaper.